Start by scrubbing your clean lips with a delicious lip scrub. You can either get your hands on an already made one – like my LUSH lip scrub in Bubblegum . Or you can use a DIY lip scrub – the most basic recipe is some honey and sugar, or olive oil and coffee grounds. The sugar/ coffee grounds will exfoliate while the honey / olive oil will hydrate. A lip scrub, store-bought or homemade, will exfoliate the lips and get rid of the dead skin; it stimulates the blood flow, improves circulation and makes your lips plumper. That’s pretty much amazing, no? Once in a while, I not only slap on a face sheet mask, but also a lip mask. Not my favorite because I cannot enjoy my glass of rosé, but I manage. Every night, I put on a generous amount of the best night lip mask from La Neige. With the tiny spatula provided, apply the cream to your freshly exfoliated lips before going to sleep, as part of your skin care routine. Every morning after a night of the lip mask, my lips feel super soft, hydrated and plumper! After removing with water the left over of the night lip mask, start your day lip routine with a nourishing lip balm. My current favorites are EOS Pomegranate Lip Balm and Burt’s Bees Honey Lip Balm. 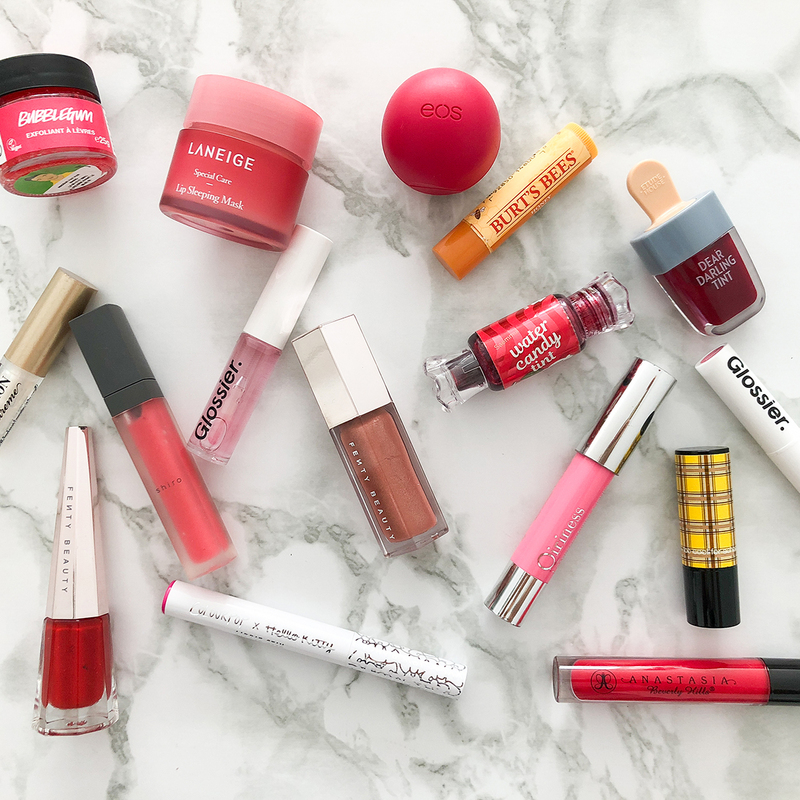 A good lip balm keeps the lips nourished and prepares them for the next step, be it lip tint, lipstick or lip gloss. If you want extra plumper lips, apply a lip plumper like the Lip Injection Gloss from Too Faced . It will sting a bit, so be ready for that. After a few minutes, your lips will be fuller and pinker. It’s perfect to finish your routine here if you want natural looking lips with a glossy shine. If you want clear glossy lips, you can definitely skip the lip plumper if it’s not your thing. My current favorite clear lip gloss is from Glossier. If you want a bit more extra sparkle and 90s vibe, you’ll want to check out the Fenty Beauty Gloss Bomb! For a sight pink sheen and minty freshness, check out the Shiro lip glosses. For some extra colour or sheen, you can choose between a lip tint (latest obsession) or a lipstick. I discovered lip tints thanks to Korean beauty and I am now loving them. They are so easy to apply, not drying and last for a long time. My current two lip tints that last for a couple of hours – including through drinking my big morning cappuccino – are the Dear Darling Tint from Etude House and the SAEM Water Candy Tint. My make-up stash has both solid and liquid lipsticks and alternate between them regularly, depending on my mood.My main lipstick categories are the nourishing ones with a natural tint (Glossier Generation G in Crush, Qiriness Lip & Cheek Balm, Too Cool for School Hot Girl Lip Sticker in Blazing Purple), bold solid lipsticks (ColourPop lippie sticks) and the liquid lipsticks (Anastasia Beverly Hills, Fenty Beauty Stunna Lip Paint, ColourPop liquid lipsticks). No matter what colored lip product you choose, make sure that you have a good lip care routine where you exfoliate & hydrate your lips.